December 14, 2017 from 6:15 p.m. to 8:45 p.m.
Michel Foucault identified in the Iranian uprising of 1978 a modality of religious political revolt and a form of political spirituality that privileged, in the secular realm, expressly religious aspirations. 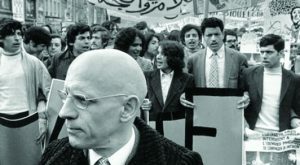 What Foucault discovered in Iran was, in his words, a political spirituality: a mass mobilization on this earth modeled on the coming of a new Islamic vision of social forms of coexistence and equality. Foucault explicitly characterized the will of those Iranians in revolt with whom he had contact as taking the form of a “religious eschatology”—not the form of a quest for another political regime, nor in his words for “a regime of clerics,” but instead for a new Islamic horizon. When those in revolt spoke of an Islamic government, Foucault maintained, what they had in mind were new social forms based on a religious spirituality, sharply different than Western models. Foucault pointed to Ali Shariati as the thinker who had most clearly posed the problematic and formulated this vision. It is to this model of uprising as political spirituality, this modality of religious political revolt that we turn to in Uprising 6/13. By contrast to the modality of revolt that we discussed during our seminar Uprising 3/13 on the Arab Spring, the modality of revolt that Foucault identified in Iran in 1978-79 was expressly and primarily religious. Much (but of course not all, as evidenced once again by subsequent events) of the ideological wellspring in Tahrir Square was more secular, leaderless, and occupational: a form of disobedience against a secular authoritarian regime—at least as portrayed in much of the reportage and documentaries like Tahrir: Liberation Square, directed by Stefano Savona (2012). The situation was very different in 1978 Iran, at least on Foucault’s assessment. And it gives rise to a different modality of revolt: a religious eschatological modality of uprising. Foucault did not condemn this mode of political spirituality—to the contrary, he wrote about it with respect and admiration for those who rose up and risked their lives against their oppressors. Foucault did warn that “Islam—which is not simply a religion, but a mode of life, a belonging to a history and to a civilization—risks constituting a gigantic powder keg, at the scale of hundreds of millions of people. Since yesterday, any Muslim state can be revolutionized from within, from the basis of its secular traditions.” But he traveled to Iran without hostility, rather with sympathy for the uprising. Respectful of the individual who rises up, in order to keep one’s indignation and intransigence for the power that represses. What a remarkable statement—and an excellent place to start our seminar on Foucault on Iran: Revolt as Political Spirituality.